Grenada is one of seven signatories to the Protocol on Contingent Rights, which deals with the rights of persons, their spouses and dependents moving to other countries within the Caribbean Community (Caricom), under the free movement of skills regime. 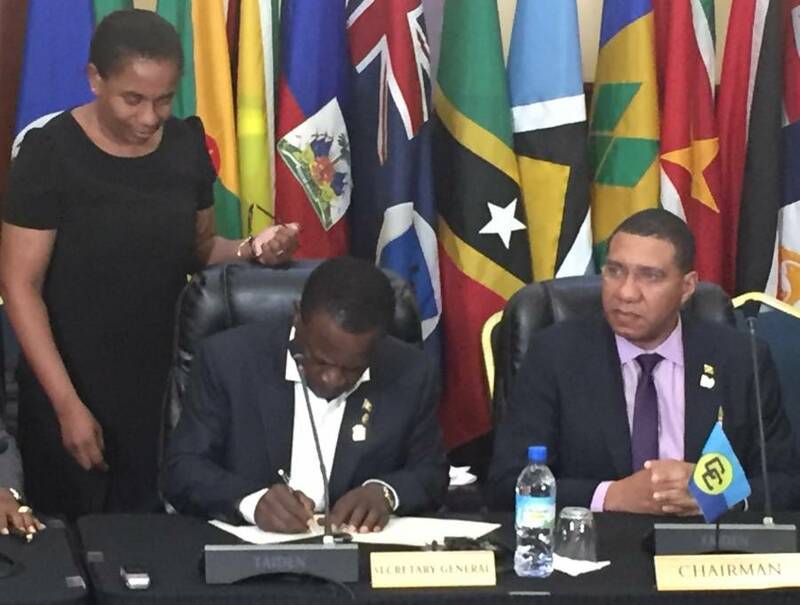 Prime Minister, Dr the Right Honourable Keith Mitchell affixed his signature to the document at the conclusion of the recent Regular Meeting of the Conference of Heads of Government of the Caribbean Community in Montego Bay, Jamaica. The protocol is considered a major milestone in the advancement of the regional integration process. The contingent rights speak to, among other things, the right of principal beneficiaries, their spouses and dependents to transfer capital into and from a host country; the right of non-discriminatory access to lands and other property; the right of the spouse and dependents to leave and re-enter the host country; the right of the spouse to work in the host country without a work permit and the right of dependents to access primary education. Other signatories of this important protocol are Barbados, Haiti, Jamaica, St Lucia, St Vincent and the Grenadines and Suriname. Issues pertaining to the CARICOM Single Market and Economy (CSME) comprised one of the main talking points among Caribbean leaders at the just concluded CARICOM meeting. Dr Mitchell and several of his colleagues repeatedly underscored the need to press for progress on this initiative. Coming out of the Montego Bay meeting, Dr Mitchell highlighted as one of the single most important developments, the decision to aggressively pursue the CSME, specifically the freedom of movement of people in a more effective manner. It was proposed and agreed that a Special Meeting of the Conference of Heads of Government will be held in November this year, in Trinidad and Tobago. It was also agreed that the Prime Ministerial Sub-Committee on the CSME will meet quarterly, with the first such meeting scheduled for September 2018. Dr Mitchell has welcomed both suggestions as they are intended to hasten progress towards the realisation of the CSME and to also hold regional governments more accountable for the implementation of actions related to this.